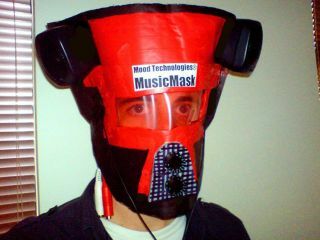 The MusicMask has stereo outputs and front-mounted level controls. Musicians are known for pulling faces when they play - the sight of the gurning guitarist is one that we´re all particularly familiar with - but until now, there´s been no way to translate the movements of your facial features into sound. This is all set to change, though, with the launch of Mood Technologies´ MusicMask. Based on military-grade technology, the MusicMask is built around the Facial Activity Kontrol Engine and can read your expressions and convert them into appropriate music. If you smile, for example, you´ll hear a major chord progression, while a frown will elicit a minor one. Variations can be added by opening and closing your eyes, arching your eyebrows or raising your cheeks. The control system sounds fairly complex, but Mood Technologies founder Dr Robert Mood says that a bundled training DVD will enable anyone to start making music with his mask within minutes. MusicMask has its own sample-based sound engine and speakers, but thanks to its USB compatibility, it can also be used to control any MIDI-capable software. This means that it could have great potential as a live performance controller; go on stage wearing the MusicMask and people won´t believe what they´re seeing and hearing. The MusicMask is still in the embryonic stages of development, so the price has still to be set. Expect to see it released around a year from now.